Ok…we all know I am not good at following directions that well. I did 2 versions of this weeks Diva Challenge (#316) whilst practicing some pointed pen tangling. The challenge was to use some form of stripes for a string. The first was a rather free form diagonal striped ATC. Done with a dip pen and some red gouache I already had mixed up. I think for run of the mill tangling, I need to work on this more. And because I am still working on getting the consistency of Bleed Proof White correct in my “FrankenPen” I did another one. This one, I purely stuck to the more flourish lifework type tangles that work better with a pointed pen, and I am much happier with how it looks. And, you get to see a pen, and the ink comparison! I think I finally have this figured out, and will write up an instruction when I am ready to make up a few of these pens for those who do not want to “do it yourself.” I’ve figured out the viscosity issue with using this pen, making it a nice, portable alternative to carrying around a bottle of white ink to dip into. So far, I feel like I won this battle! And from last weeks Diva Challenge (#315) I could not leave well enough alone, so I went back in and shaded it with some gold Pan Pastels…it is very sparkly in person. You may ask, CharKat, why are you doing so much pointed pen work? Simple! I want to teach YOU how, so I need to practice. And guess what? The class is the 10th of June! I am working up a wonderful experience for you, and would love to have you at the shop. But never fear…if you can’t make it to me, I will have the class kit available for you online, and maybe even a little video instruction after the new website goes live! Sounds like fun, eh? I will have the schedule up here, on the old site, by Wednesday. Man, it felt good to do all that this week! My brain feels awesome, and my heart is full. Finishing things, and cleaning up, has really been nice. Now I just need to hire a housekeeper for the rest of the house! And on that note, I am going to put more pen to paper, and raise a glass of Single Malt to remember a friend who left this world 8 years ago. Wow, you were indeed very busy. Results are very beautiful too. Good you raised a glass to that friend! FABULOUS post, and again you are inspiring me. After reading something about the bleedprood white and the pointed pen, I wanted to try it, but really got frustrated by the ink. Wish I lived closer to take your class but looks like I will have to wait for the kit to become available. Every one of these tiles is eye candy to me – l love the elegance! Wow! Lots of awesome work! Love the results of the pen work and your little books look like fun! Glad you took the time out to raise that glass! Wonderful all of it. Very inspirational. So many pretty things to look at again this week. I especially like the one in black and white, the gem, and the pretty in pink one! Nice to remember a friend that way. Gorgeous tiles – and thanks for the white pen experiment! Busy and talented. I like your red ink one but the one with the white ink is just fabulous. It just flows across the page. Your practice is paying off. Wow. Beautiful art and interesting classes! I’m going to check where you are to see if I could come! 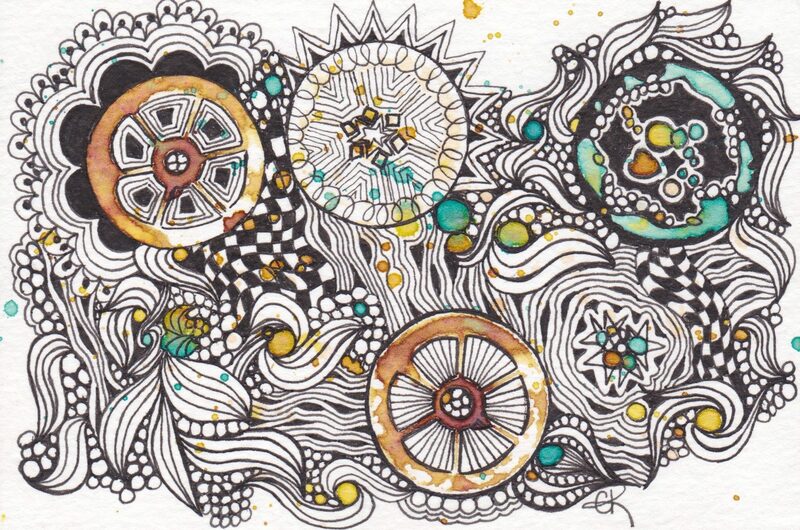 I think I may be inspired enough to use my own pen and ink to try Zentangles. It really is beautiful, even the red one that you didn’t like so much was lovely.